On this technically easy MTB tour, high-quality, coarse trekking bikes are welcome. However, steep climbs, numerous gravel passages and short, easy trails require good gear ratios and wide tyres. We will start in the beautiful area of the Carinthian lakes and use a bicycle path along the railways to Kranjska Gora, we will climb up the Vrisic pass via several serpentines and we will enjoy the wild Slovenia. When we reach Slovenia, we will follow the emerald green torrent “Soca” and cross the vineyards of the Collio, which will remind us of Tuscany. Our final destination will be the Adreatic Sea. You’ll receive all travel documents about 14 days before departure. They contain the exact hotel address and further information. Please arrive by about 6:00 p.m.. You’ll meet your group and the guide. After discussing the tour, the group will go to dinner together. Today we will see the beautiful Carinthian lakes while riding over hilly ways. Of course we have to stop to go for a swim. Our first destination will be a comfortable city hotel in the historical center of Villach. The day will be filled with great views of the Julian Alps. Passing the “Faaker See” we will ride on an old roman track across the border to Italy. We will continue on cycling paths to the Slovenian Kranjska Gora. The contrasts in the landscape are stunning. We will stay in a 4-star hotel. The royal stage today will lead us across the “Vrisic pass”. Russian prisoners of war built this spectacular road as an supply channel. 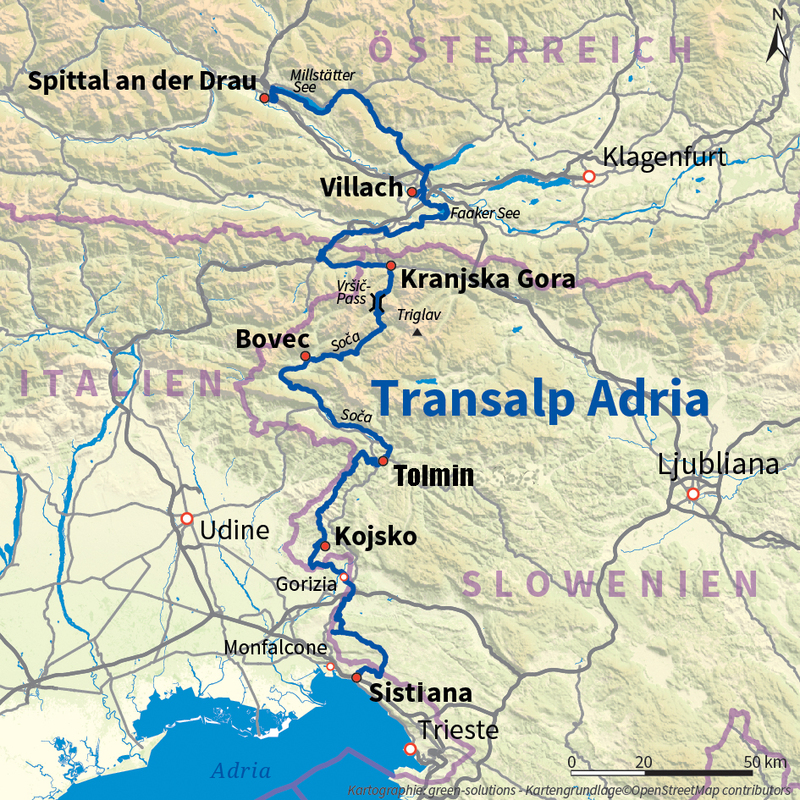 Today it leads us through the Triglav National Park and down into the valley of the river Socca. Clear and emerald green water flows in it. Overnight stay in outdoor place Bovec. Mainly on small side streets we follow the valley of the river Socca. The mountain panorama is stunning. We cross adventurous suspension bridges. We will stay in the valley of soca in a guesthouse. This day is filled with long ascents and wild solitude. The boundary region between Slovenia and Italy is nearly deserted. We will have lunch in a rustic Trattoria and go on to the vineyards of the Collio. You will feel like being in Tuscany. We will stay in a hotel in San Martino. Winding alleys and historic architecture characterize the villages of this region. The area is well-known for its excellent wines. We will stop for another cappuccino in the historic center of Gorizia before we start our final challenge. After lunch it is downhill almost all the way to the Adreatic sea. We will have our farewell dinner directly by the sea. After breakfast, the bikes are loaded onto the bus. Return trip by bus to Spittal. Upon arrival, everyone travels home individually. Arrival: Arrival by car or by train to Spittal/Austria. Type of route: Forest and bike paths, asphalt secondary roads, gravel paths, pass roads. Included in the price: Guided tour with 7 overnight stays and half board (breakfast buffet, multi-course dinner menus, farewell dinner) in good 3- or 4-star hotels in a double room (1 guesthouse), sometimes with wellness areas, luggage transport, return transfer in a comfortable bus. June: 08. /	15. ** /	22. /	29.